The Mist – When ‘bad’ just isn’t good enough . . .
You’re talking about a movie you’ve seen. There’s a character that just doesn’t sit right with you. Whether you’re writing a review or chatting with friends, you try to be critical. But it’s hard. There’s just something about this one character… something bad. You can’t put your finger on exactly why that is: it just is. 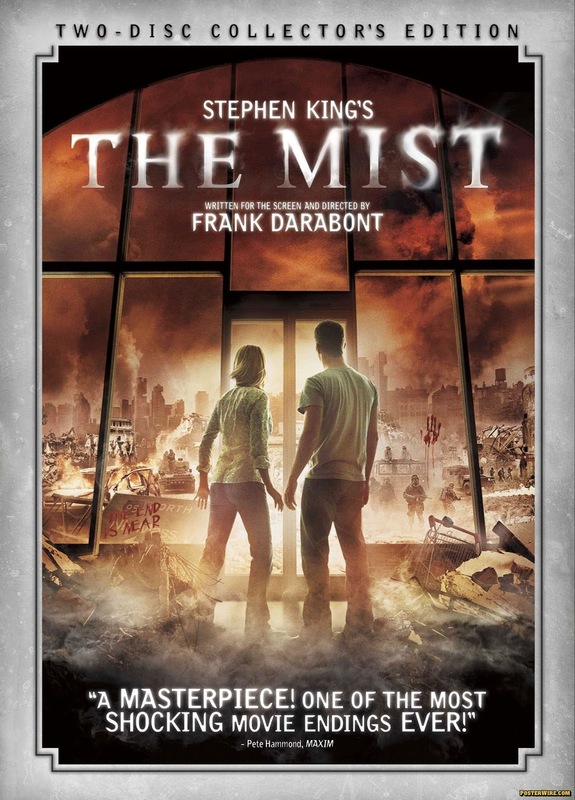 I’ve just had this experience with The Mist, Frank Darabont’s 2007 Stephen King adaptation. There’s a pretty central character that I just couldn’t shake. The Bible-spouting antagonist; almost every apocalyptic survival story has one, it’s just this one (played by Marcia Gay Harden) really ground my gears. Now, admittedly, it’s an archetype that never plays all that well with me – the vast majority of the time, I just want them to shut the hell up so we can get on with the story* – but that got me thinking. How far can the ‘they’re an antagonistic character, you’re not supposed to like them’ defence really get you? On the one hand, we have the enigmatic ‘villain’ and the complex anti-hero, who can both be fascinating and mesmerising characters, if handled correctly. Think The Joker, Walter White or Hannibal Lector. Then you just have the straight up bad guy. Take Corey Stoll’s Darren Cross/Yellowjacket in Ant-Man; we meet him, his plan is revealed, we identify said plan as incompatible with the protagonists needs/wants, and thus he becomes the ‘bad guy’. It’s all very brief and we’re given everything we need to know without having to spend all that much time with the character. He’s then just someone to defeat. It’s far from revolutionary, but it’s works. There she is, pointing fingers . . .
Then we have the nagging ‘why won’t they just go away’ antagonists . . . These aren’t always the primary villains (although, in The Mist, Mrs. Carmody kind of is) and they don’t always last that long (if only . . .), but they definitely make their presence known. As soon as the first ‘doom and gloom, hellfire and brimstone’ line came out of her mouth, I knew the character would be a tough sell. But the point of no return came when the most weak-willed of the supermarkets survivors started to congregate at her feet. That was it. I was done with the character. I felt every single painful minute of running time she spent on screen, desperate for her impending demise. *SPOILER* It came, thank God, but not soon enough *SPOILER*. And there she goes again . . . But why did I take against the character so fiercely? Is it just because I often struggle with that type of role? Maybe . . . but there has to be more. It’s not enough to say I didn’t like ‘A’ because it’s a rubbish letter. Now, some of it could be down to the performance. Harden never really seemed to provide a way in to the character. There’s no shared ground. The only thing worth ‘supporting’ is her undying faith in/dedication to her cause. But when that cause is BS, what’s left? The character goes all psycho on us before we’re given the chance to get to know her. It’s like walking into a house party and seeing a guy tricylcing through the living room at 9pm; you know you won’t be talking to him for the rest of the night. But performance doesn’t just stem from the actor. There must have been some irritating character foundations written into the screenplay, something for Harden to play off. And, even if that’s not the case, there’s still the director giving her the A-okay to play the role with such irksome didacticism. Oh, and this time it’s a knife. How novel! But that just brings me full-circle; I don’t care who’s at fault here, I don’t like that character and she casts a long and soul-destroying shadow over the whole movie. I went in search of an explanation, and just found myself reinvigorated with yet more unsubstantiated, but overwhelming, infuriation at that character. How do other critics do it, how do they explain and elaborate upon their every opinion? Sometimes, I just want to say something is bad. For no other reason that I didn’t respond to it at all. So now you know, if I call something’s bad and don’t/won’t/can’t explain myself, then you know something’s off . . .
*on a side note, why is The Mist 127 minutes long? I mean, really . . .
← Just what it says on the tin!